Since I had had a very adventurous and active last two days, on Thursday I decided that I needed to do some intense leisure. I knew I needed to get up to Jeju City at some point, and decided that since I'd heard they have the best beaches in the north, I would go sooner rather than later in order to make the most of my day. After texting my couchsurfing host, I wasn't completely sure about getting to their place. My host was going to be leaving for the airport around noon, and he gave me his roommates phone number. I texted the roommate and asked for a little more help in figuring out how to get to the apartment. Thankfully, he was extremely generous and offered to meet me at the bus stop and walk me back to the apartment. He also told me which bus to take and how long it would be from Seogwipo to Jeju City. So, after getting ready, grabbing some breakfast, and packing up the last of my stuff, I got to the bus terminal around 9:30am. I bought a ticket to Jeju City easily, but I ended up waiting around 15 minutes. In that time, a little girl and her grandmother came and sat on the same bench as me. The grandma sat around 4 seats away, and the little girl sat right next to me. She was hilarious, kept staring at me and giggling. They broke open a tub of vanilla ice cream and I heard the girl say the ubiquitous Korean phrase when having the first taste of absolutely anything: 맛있다. I couldn't help but laugh a little at the cute little voice exclaiming over the wonderful ice cream was. I said "hello" to her, which most Korean kids know from their indoctrination, I mean, education. But maybe she was too little and she just laughed and giggled some more. Her grandmother said something to her, which I assumed was "Don't be shy, say something to her!" She laughed and went and hid behind grandma. I laughed and turned back to my phone. Slowly the girl crept back over and sat next to me, and continued to stare at me in intervals while eating the ice cream. After a couple minutes, she got a bit scoop of ice cream and turned and offered it to me. How could I resist such a sweet offer? She fed it to me and I said the same 맛있다 (delicious!). She laughed some more. Eventually she and her grandmother got on a different bus and I waited a little more for my bus. Finally, it arrived and I put my suitcase in the undercarriage and settled in. It was only a 50 minute ride to Jeju City (thankfully), and sure enough as I got off the bus at my stop, there was a white guy waiting for me. His name was Mike and he was English. He kindly hauled my suitcase to their apartment and up 5 flights of stairs (I was eternally grateful). Their flat was pretty much like you'd expect 2 guys' apartment... kinda messy and a little dirty, but bearable for one night. I met Harold, my official host, for about 10 minutes before he headed off to the airport. They showed me to the spare room with my bed and showed me the bathroom. After a couple minutes to get oriented, I asked them where a close, nice beach was. 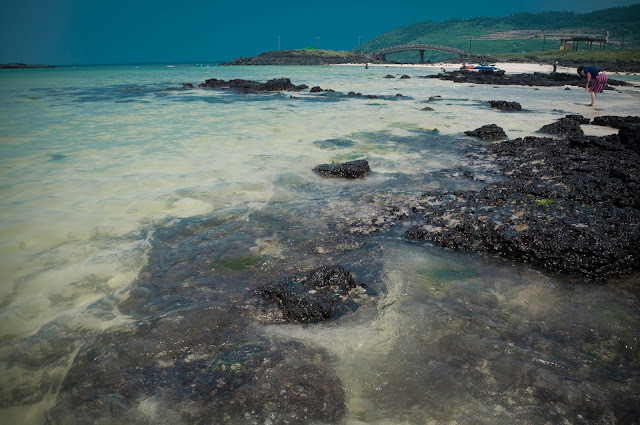 They showed me a big map and pointed out a couple before deciding that the best beach would probably be Hamdeok beach, for location and quality of beach. I left a few minutes later to head back to the bus stop and catch a bus for the beach. I am quite proud of how easily I caught buses and didn't get lost. Anyway, I got a little nervous about where to actually get off, so I asked the bus driver. He was a little gruff, but he did point at the door when I needed to get off. I walked through the beach parking lot and onto the beach. It was crowded with parasols and tables and chairs, and lots of families with kids. My hosts had recommended I go to either the left or right of that main beach over the hill on either side for a more seculuded beach. I chose left and when I got to the top of the hill I saw a little cove type area. There was extremely shallow water for maybe 20-30 feet, then a sand bar where maybe a dozen people and 3 parasols were. I decided to head for that. I had to actually wade through the water to get to the sand bar, then once I had chosen a spot, I walked all the way back to get a parasol to rent. I was already sunburnt from 2 days spent entirely outside, and didn't want to make it any worse, so I coughed up 15,000W for a parasol for the day. I applied SPF50, too. Anyway, a kid from the rental place walked the parasol over to where I wanted it and dug a hole for it. After I got all set up, I reapplied some more sunscreen and got my toes wet. I then took a little nap under my umbrella. It was a lazy and relaxing time. I snacked a little and regretted that I was alone because I really wanted to go get some food, but couldn't leave my stuff and didn't want to lose my umbrella! So, I just waited it out, got in the water and enjoyed the beach. The water was ridiculously clear and beautiful. 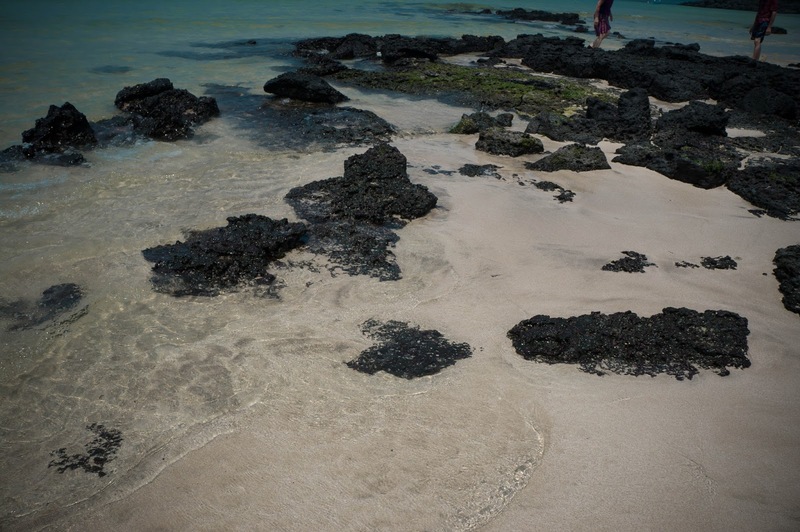 There wasn't much seaweed and I saw several schools of small fish swimming around. 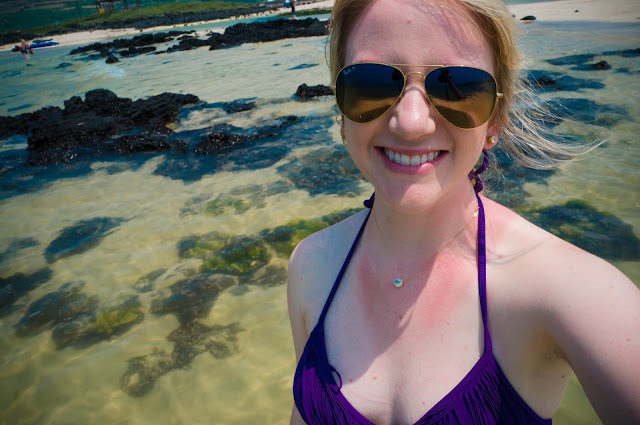 At one point, a Korean guy tried to hit on me while I was enjoying the waves. I told him no and he wandered off. 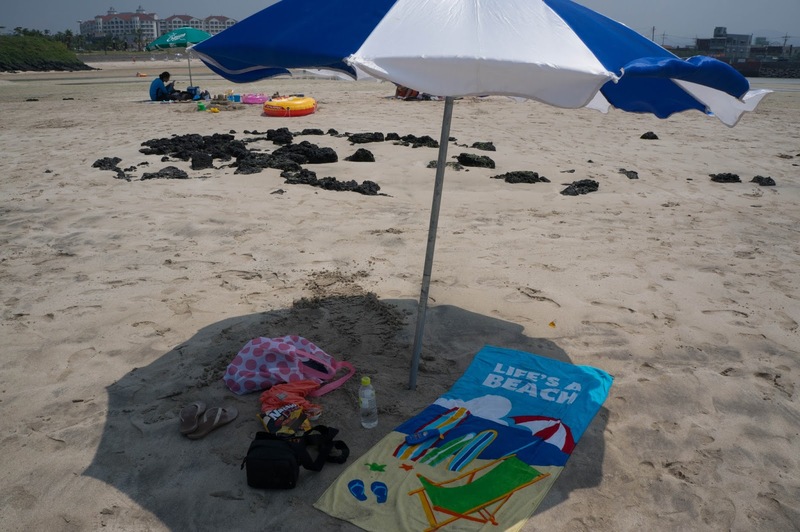 I then rearranged my towel under the umbrella due to the moving sun/shadow. I took another small nap and when I woke up I decided that I was sick of being covered in sand and saltwater. I packed up my stuff and headed to the bathroom to change into something dry for the bus back. Unfortunately I was extremely sticky and the sand wasn't coming off easily. I managed to get most of it out of the essential places, but without a shower facility, I was kind of screwed. I got into something dry and headed for the bus stop. I waited around 20 minutes for the bus I knew I could take but when the #10 came around a second time, I got frustrated. Thankfully there was English on the side and I saw that it goes to the same place my bus was going to, City Hall. I decided to wing it and got on the bus. I finally figured out how to say City Hall in Korea and asked the bus driver to be sure, and he nodded yes. Almost an hour later, I staggered into the apartment which was thankfully empty. I showered off and realized that I had gotten some serious sun. Despite a parasol and 2 coats of SPF50, I still had some intensely red legs and back. I cringed getting in the shower, but once I was clean of sand and salt, I was happy to lay on the bed and let some much-needed aloe soak into my poor skin. I decided that I'd had enough of the sun and outdoors for the time being, and decided to get a pizza. Around that time, Mike had made it to the apartment and he offered to show me some local pizza places on his way to work. I got a cheese pizza and brought it back to the apartment and contentedly watched Pretty Little Liars on my iPad in bed while eating way too much pizza. After about an hour and a half, a guy I'd never seen walked in the door. His name was Frieder, and he was another couchsurfer from Germany. We chatted for a while and decided to go get something to drink. He was really interesting to talk to. He was Germany, studying in the Netherlands, and taking a semester abroad in Incheon, Korea. He arrived early to get around Korea and see everything. He'd been in Jeju for a few days already and was lucky enough to use Harold (my host)'s motorcycle around the island while Harold was out of town. We had a good time chatting. When Mike got home from work, we 3 decided to go out for a beer at one of the local bars. Thankfully it was only 2 minutes walk, and I wore my loosest Nike shorts and a baggy t-shirt (my skin was not feeling too good). It was the first place, outside of Itaewon, in Korea I'd seen foreigners outnumber the Koreans. Mike seemed to know everyone and introduced us. Everyone was cool and it seemed like the Jeju ESL teacher community was pretty tight. I had one beer and called it a night, in preparation for my departure in the morning. I slept alright and headed out around 815 the following morning. Instead of dealing with a bus, I got a taxi to the airport and checked into my flight. It was an uneventful trip back and I was very thankful to get to my clean apartment. I got ready (having skipped a painful shower in the morning) and met Romeo for a late lunch/early dinner. It was a great trip and I feel like I accomplished many things I wanted to do in Jeju, but the relaxation part was a little lacking. I guess going on a budget for a short amount of time, plus a complex about "wasting time" doesn't make for a very relaxing vacation. But I made up for it with a lazy and relaxing weekend before heading back to work on Monday. I was so thankful for some time off and it was definitely needed. Monday I could tell I had renewed patience and enthusiasm for work. Thank goodness for summer vacation! Awesome!. You make such good photos. Narrative superb.